Life has been so super duper chaotic lately. If you’ve been following me on Instagram or Facebook you’ll see that I have been super quiet there. 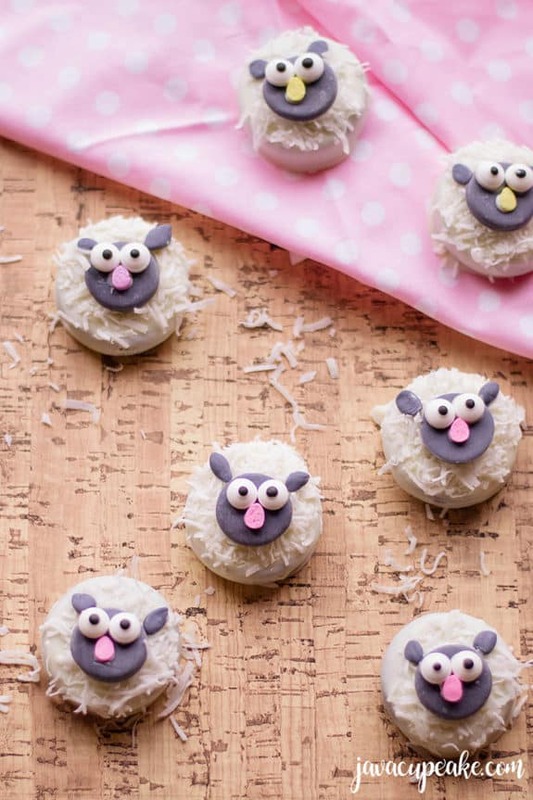 These adorable lamb cookies make me happy and I really hope you love them too. In early April, I was in a massive (for me) car accident where I was rear ended on the highway. I had to bring my car to a quick stop because the cars in front of me were stopping. The car behind me was still going full speed and plowed into the back of me. The car behind that guy didn’t slow down or stop either so I got hit a second time. The two impacts caused my body to be thrown back and forth in my seat and my head to hit the headrest repeatedly. An ambulance came and took me to the local emergency room. The doctors there ruled out a spinal cord injury but they did conclude I had a concussion. Also, my car was totaled… but that’s a story for another day. For the weeks following the accident, I suffered through some of the hardest days of my life personally. I’ve been able to handle a lot when it comes to my husband, kids and family… however when it came to dealing with my head injury, it was a lot harder to deal with. Thus my blog, my work, my life needed to be put on pause then reset. Fast forward a few more weeks and here I am. Not back to 100%, I probably never will be, but back to a point where I can type, write, and begin to think about the future. This recipe is not an original, but it is one that I think you’ll like. You’ll be seeing more of these kinds of posts for the foreseeable future because I just need the time to heal. I know you’ll understand… because if you’ve gotten this far into my post… you’re a loyal JavaCupcake fan and you’ve always been there for me. 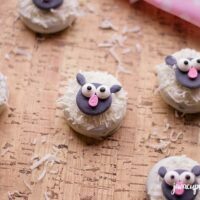 Thank you and enjoy these super adorable lamb cookies! Begin by preparing your fondant shapes: add 3-4 drops of black gel food coloring to your fondant and fold and knead until completely colored. 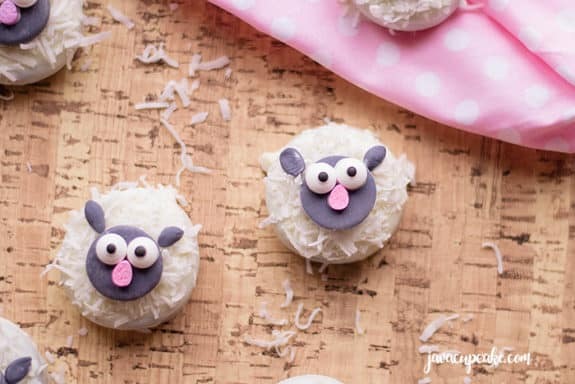 On a surface lightly dusted with cornstarch, roll out your fondant to be about ¼ of an inch thick and cut 12 small circles. These will be your lambs’ head. 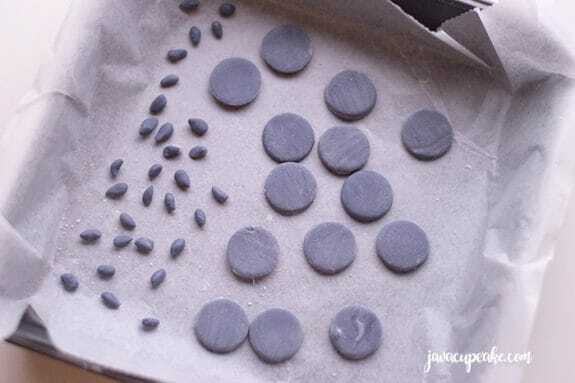 Shape smaller pieces of your dark grey fondant into tiny oval shapes. 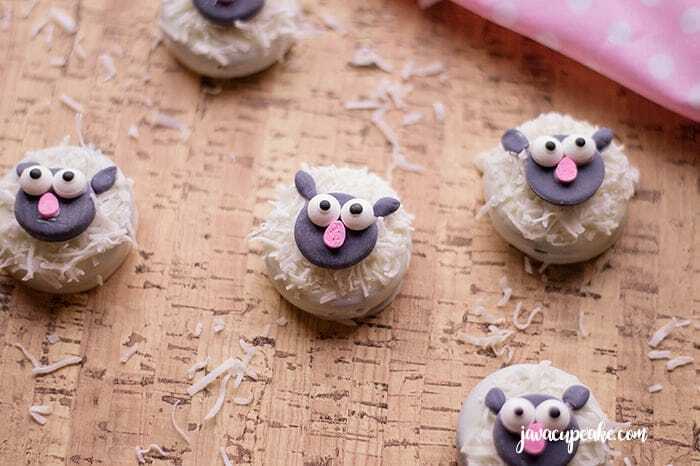 Make 24 of them: these will act as your lamb’s ears. 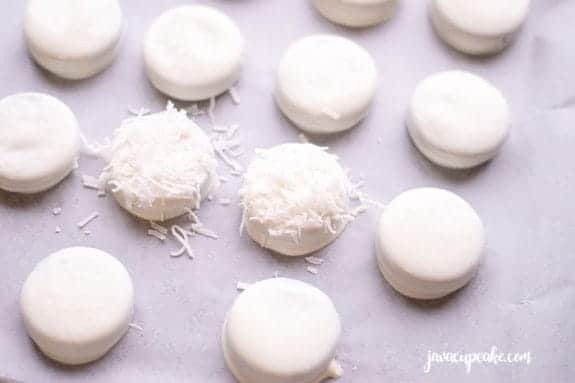 Microwave your white candy in 30-second intervals until completely melted. 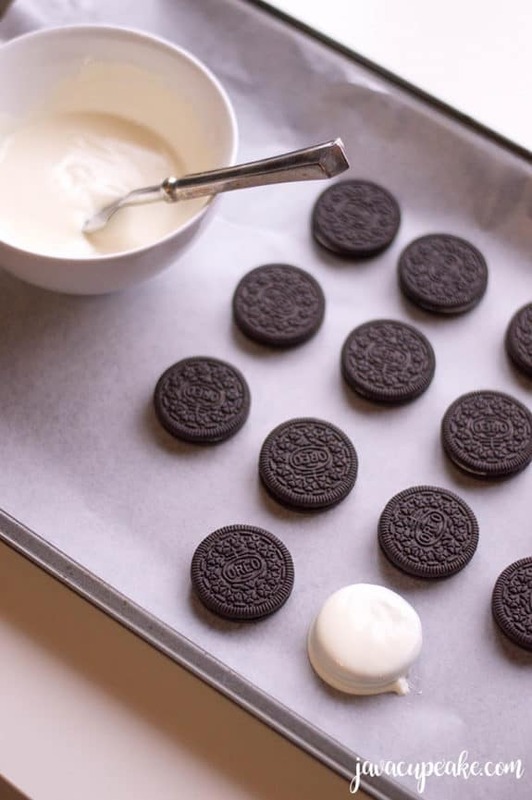 With a fork, dip each Oreo into the candy and set on your lined baking sheet. 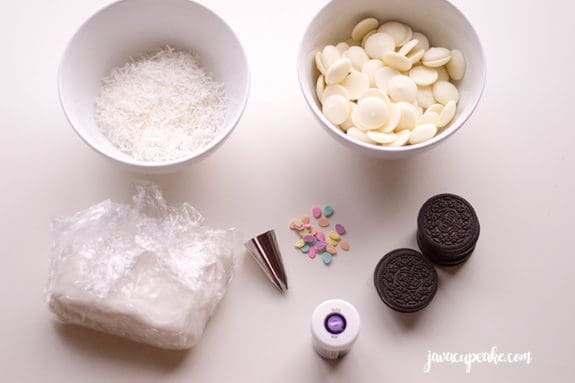 Place one circle-shaped fondant in the center of each Oreo cookie. 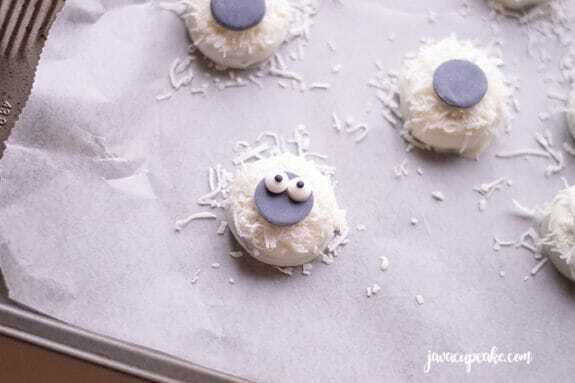 Sprinkle your shredded coconut on each one. Using a toothpick, apply a bit of white candy melts on the back of each fondant ear. Gently place on each Oreo cookie. Apply the candy melts on your candy eyes and your sprinkles. Apply on face of each lamb. Allow to set for at least 30-45 minutes. I’m am so sorry to hear about your accident and hope you are back to feeling 100% very soon!